Cycling might be a healthy way to get around, but what about all the fumes you breathe in while stuck behind a lorry or a moped? Senay Boztas has been finding out about efforts to quantify exactly what cyclists are inhaling. Laden with solar panels, video camera, batteries and three air-pollution measuring devices, the ‘soot’ bike is no easy ride. Not only does the €30,000 electric vehicle weigh a ton. But a spin on this bicycle will also weigh on your mind. The whole point of the air pollution measuring bike is to record the nitrogen dioxide, soot and ultrafine particles that you have just breathed in en route. A study last year suggested that the Dutch live, on average, four months less due to nitrogen dioxide in the air, and even though estimates for future air pollution levels are falling, last autumn a court in The Hague ordered the government to do more to improve air quality. Some believe that mobile measurement systems could help. 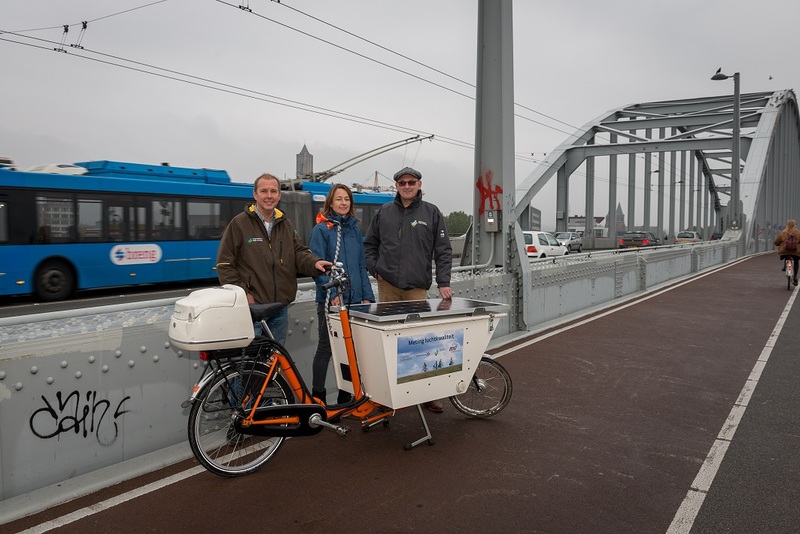 At the Velo-City conference in Arnhem-Nijmegen last year, Gelderland-based researchers Moniek Zuurbier and Paul Agelink gave a presentation on an innovative vehicle they built to gauge the precise effects of traffic fumes, from the cycling lane itself. 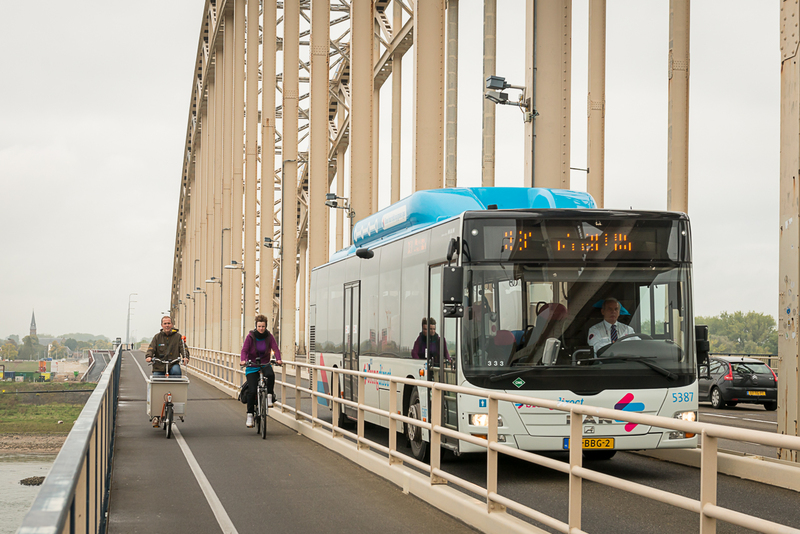 A team from Arnhem environmental services department was asked to compare the pollution experienced on a cycle ride along a new bike superhighway between Arnhem and Nijmegen, the Rijnwaalpad, and cycling the old way through villages including Elst. The cycle path, for some distance, runs alongside the A325 road, and the Dutch cycling federation was concerned about air quality there. The team – including fellow expert Coen Jurcka – also wanted to investigate the effects of scooters in the bike lane on the air for cyclists. The idea, he explained, is to record how different types of air pollution peak during a journey and compare this with video images to see the cause of spikes and falls. “We measured both routes eight times, and the conclusion was that the new route is better than the old route, because of the effects of stopping still next to cars,” he said. He stressed that although levels of air pollution in the area do not exceed European limits, the bike still showed worrying hot spots: at red traffic lights, in close proximity to a lane of motorised traffic, and at the mouths of traffic tunnels. Although only nitrogen dioxide is a part of European norms at present, the researchers also measured soot (black carbon, or BC) and ultrafine particles (smaller than PM0.7). The World Health Organisation links such air pollution to increased risk of strokes, heart disease, lung cancer and respiratory diseases including asthma. It would be good if there were norms for these things too, said Agelink, explaining that due to difficulties in standardising measurements, this has not happened Europe-wide. In their presentation to the Velo-City conference, the researchers stressed that cyclists’ exposure to pollutants could be worse than other traffic users: they take more breaths per minute as they exercise, often cycle close to pollution sources, and because cycling is such a ubiquitous mode of transport in the Netherlands (with its estimated 22.5 million bikes). According to a paper by fellow researcher Dr Zuurbier, the concentrations of air pollution varied a lot from day to day, and ultrafine particle exposure was significantly higher on the old route. The bike superhighway exposed cyclists to slightly more nitrogen dioxide ‘although not significantly’, but passing scooters and motorcyclists also led to peaks in ultrafine particles – with some models of motorbike much worse than others. The consultant in environmental health and environmental epidemiology at Public Health Services Gelderland Midden went on to do a second study which she hopes to publish later this year. This looked at the influence of mopeds on cyclists at several fixed locations on cycling lanes in Nijmegen, Arnhem, Amsterdam and Harderwijk and showed clear peaks in pollution with passing mopeds, particularly from those with two-stroke engines. Dr Zuurbier says that working out the precise pattern of air pollution in traffic is essential if we want to ensure this mode of transport stays healthy – because in the world’s most polluted cities, for example in Asia, cycling is even believed to be a health hazard. Anne Krol, campaign leader on transport and air pollution for Friends of the Earth Netherlands (also called Milieudefensie), helped take the Dutch government to court in September to legislate for cleaner air, arguing some parts of the Netherlands breach European limits. She said innovative schemes such as the air pollution measuring bike can help locate precise problem points. In the new Dutch government, environment appears to be more of a priority, with a pledge to incorporate new national climate targets in law, close all coal-fired power stations and reduce greenhouse gases by 49% from 1990 levels in 2030. A spokesman for the environment department said that the government is protesting one part of the court judgement on cleaner air, but ‘must come up with a new plan for better air quality’; it is busy mapping high-pollution areas such as Amsterdam, Groningen and places with a lot of livestock farming.